Jove Francisco was recently featured in a column by Mr. Fu for Manila Bulletin. 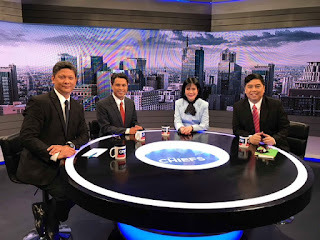 In it, the veteran journalist talked about his new assignment as the executive producer of the nightly talk program The Chiefs, airing on Cignal TV's One News channel. Francisco said that the program allows him to be in the know of the current events, which he used to cover back when he was still a field reporter for TV5. For Francisco, the collaboration of different news organization heads — Ed Lingao, Roby Alampay and Amy Pamintuan — is what makes The Chiefs "unique." “You have four anchors who manage newsrooms the whole day, then converge in the studio carrying all the info gathered by their teams. At the end of the day, they already see the bigger picture and it comes in handy when they sit down and interview personalities," he said.